Totally ASUS provided the Rampage III Black Edition with eight angled SATA ports which should be enough for any office PC or gaming system. You'll also find practical onboard power- and reset-buttons. ASUS even thought of a debug display which is very useful if you should once have issues with one of the components in your system. In combination with multi GPU setups it's very practical that there between the different PCI-Express x16 slots there is space. In this case the cards can get plenty of air to operate at adequate temperatures. 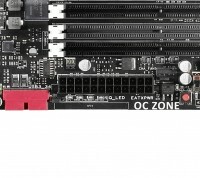 If you should choose to place a video card into the last PCI Express x16 slot close to the bottom edge of the board all the connectors will be covered by the card. 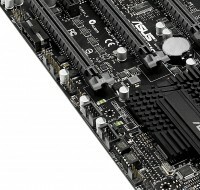 Totally you'll find eight fan headers on the ASUS Rampage III Black Edition which is more than enough, to provide a well equipped midrange or even a high-end-system with fresh air. 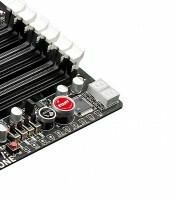 The fan headers are located around the CPU and their also spread over the whole board which makes them easily accessible from any position in an enclosure. 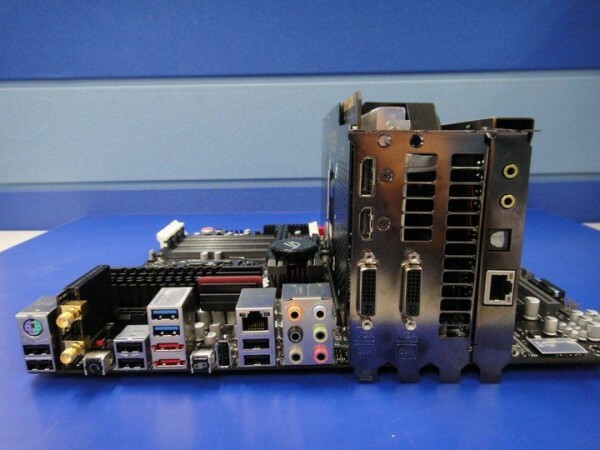 Looking at external connectors and buttons directly at the back-panel ASUS equipped the Rampage III Black Edition with a PS2 mouse/keyboard connector, six USB 2.0 and two USB3 ports, two eSATA ports, one gigabit ethernet port, an analogue audio panel as well as a Clr CMOS button and two connectors for WiFi ariels.